I love XM-L because of its beam profile , it spreads light out so that you can see what is in front of you in such a way as to not draw your attention to a single hotspot [ something the XR-E does too well ] . This allows me to see more , of what is around me , and more importantly , what I really need to see . I also like the emitters efficiency and its power , and in larger reflectors it can become a throw monster whilst still remaining useful at closer ranges .. In all fairness the XP-G comes close to being as good as the XM-L , but it simply cant run at the same power output of the XM-L , even at the same current the XM-L is the better emitter [ varies dep on what you want ] . For me , the emitter of choice has become the XM-L , other emitters are almost obsolete , and those still seeking XR-E throwers ? , really need to check out a XM-L thrower . 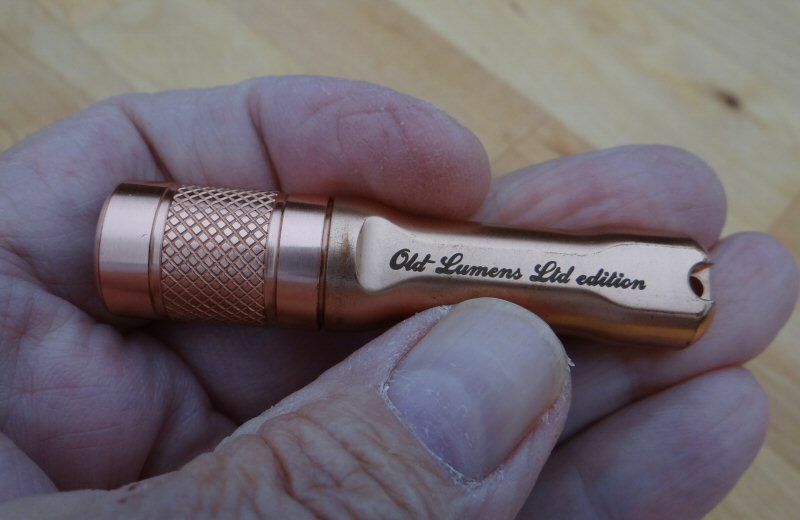 The XM-L has become one of the most versatile emitters ever , it will flood , it will throw , and do a combination of both . It will perform at high current and low current , the only thing left for the XM-L , is to produce even more power . I am not afraid of spiders but that one is creepy. I don't like. I have zero XM-L lights so it looks like I need to check one out. I am not super impressed with the XP-G to be honest. It can't throw worth a darn in the lights I have tried. If a light can't throw 100' or so, I can't really use it. My Klarus P2A runs out of steam at about 70' or so. It will light up futher than that but not nearly well enough for me. I want a spot light out of a 2AA light. I feel 'blessed" to have started my flashlight addiction just before the x-ml was released. I couldn't imagine a world without x-ml lights now. Looked it up - your right - apparently there are over 100 different types of Orb Weaver .. The things you see when you have a flashlight ! Maybe just tape a 2aa to the hood of a car and use the headlights, leaving the 2aa off? Oh, man, I love the XM-L's... finally something bright enough that it works for my abysmal night vision. I don't like laser spots either... give me flood any time. And the lights I modded won't become obsolete 'cause I won't need to change poor emitters. With the Ledil Booms I use, (MCE-S) the triples I've done are unbeatable... there is a big, soft hotspot, not distractive, that merges beautifully into a huge, bright flood. Not just "useful spill" which is another way of saying "the spill isn't worth a s**t but I don't wanna admit it" but really bright flooding. Tint variations from hotspot to spill get taken care of with the Ledils or an OP reflector. If you are after a nice tint you have to put up with a pronounced tint shift with the XMLs , Even the neutral ones . White hotspot , yellowish corona , purple fringe in the spill . My solution is to diffuse my XMLs , which nicely blends the beam into an even color . XMLs are floody anyway , so diffusing them makes a beautiful floody and artifact- free beam profile . I suppose I've become a bit of a snob about tint and beam profile . If XM-Ls are floody, I probably should look elsewhere for a thrower I guess. So far , as I understand it , the smaller the reflector , the more the XM-L floods out ... But , the larger the reflector , the more it throws ..
A P60 I find a good balance , of flood to throw , but the larger the head the more they tend to throw . That's the downside of the XM-L and even XP-G... the wide beam angle needs a large reflector to get some throw (C8 and bigger). I am looking forward to emitters which can produce the XM-L output on an XP-E die area without thermal issues. I really like the XP-E beam profile in my smaller lights. (my keychains, E21, EW J09, Skyray S-A1). Weren't there plans from Cree to make XP-G- or XM-L-like emitters with a primary optic like the XR-E has?... I could have sworn I read about it somewhere. I have the TrustFire X9. Given the 59mm head diameter, I bought it for throw, but I'm disappointed. With less than 2A draw (eBay version) it actually does throw far enough for my needs, meaning that a target at about 150m gets enough light. Problem is the spill, or more precisely the bright and wide corona that persists even in this reflector size. Viewing along the beam line (i.e. holding the lamp at waist level), the distant target image isn't crisp enough to reveal detail, but rather hazy instead, due to atmospheric light scatter. If an assistant holds the light and I move sideways 5-7m, only then the target image will be nice and sharp. In normal use, my XR-E throwers provide more image resolution (better detail recognition), regardless of lux on target. I'll try to convert my X9 to an off-focus aspheric to get rid of that spill. and erh.. very short essay. i think the definition of "essay" includes that it has to be long. for example, if i write 3 standard sentences (not overly long, not overly short), nobody would or could call it an essay. Trustfire tr-803, single 16340 @ 1 amp, with ramping. Shallow op reflector. Perfect flood, nearly invisible hot spot. 2D Maglite mod, 2 18650's @ 3A,h,m,l with deep smooth led reflector. Flood and throw nearly equal. Massive raw output. p60 drop in, 1 18650 @ 1.4a single mode, smooth reflector. More flood than throw. I'm with the OP, I love XM-L's. My neighbors are always surprised when they see me with a 'tiny' Solarforce L2 that lights up my entire front 1/3 acre, I think I have sold a lot of lights for Solarforce-sales. My best throwers are also XM-L's ; Two C8-style lights and my TK41. They aren't "pencil beams" by any means, but they throw as far as I can imagine I would ever want without going to a full HID-style spotlight. emitters, at least for me, have rendered all the others obsolete. i think it will be quite a while before we see much of an improvement on them. I love XM-L's. But I also love XP-G's, XR-E's and XP-E's Its all a case of horses for courses. Each has its strengths and weaknesses. Just as does a SMO reflector or an OP reflector or an Aspherical lens or a TIR lens. This obsession, interest, passion or hobby that we all share is surely all about understanding all the pro's and con's of the various components and then selecting the ingredients we want for the particular meal we are preparing at the time. Yes, its true, the XM-L may well be a delicious piece of T-bone Steak but it sure as hell don't cut the mustard when you're looking to produce a Waldorf Salad. There really is no universal emitter yet, not even the XM-L.
....and erh.. very short essay. Becomes an essay when people contribute to the thread , and maybe some poetic license . I mentioned this elsewhere, but it's useful information -- if you're not happy with a cool white XM-L, try using a Lee Filters #774: Soft Amber Key 1. You can simply cut a circle the right size from a Lee sample book, and place it behind the lens. This filter has a slight frosting, so if colors or artefacts continue to stick out, it will diffuse them a bit. It rendered my Manafont Ultrafire XM-L pretty much neutral -- there's a slight bit of green in the corona, and magenta in the spill, but it's more than acceptable. fair enough, and i agree with all of your points. i still like throwers, and less bright emitters for smaller AA lights, but i primarily like LUMENS, and in medium/small, easy to carry lights, nothing beats a well driven xm-l. just my two cents of course. I like the XM-L better, regardless of application. Even though it may require a larger reflector for example, I still prefer it to throwers with other emitters. Having said that, whenerver I doubt XR-E performance, I break out my little used MPP 1 to remind me just how bright the surface of an emitter can get. Damn, that thing can throw. that's one of the reasons i like smaller die emitters. color is usually way more consistent across the entire beam. i can always slap a diffuser on it if i need flood. i'd probably feel differently if i needed big lumens, but i rarely really need more than 200 for the stuff that i do.